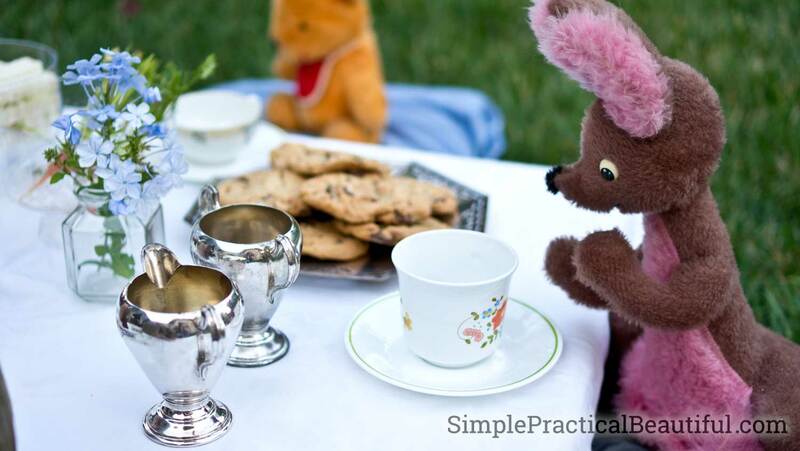 Celebrate like Winnie the Pooh with a Christopher Robin tea party and invite all your friends and their favorite stuffed animals. Just don’t forget the honey. 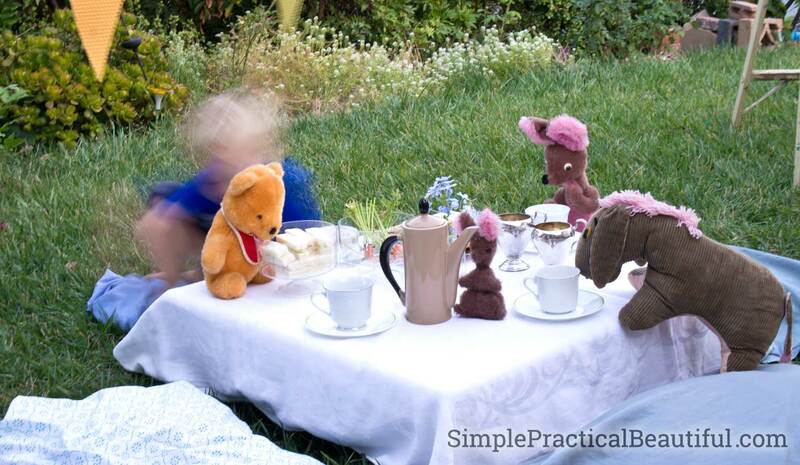 After watching the movie, we were inspired to create a Christopher Robin tea party just like the scene in the movie where the residents of Hundred Acre Wood are having a farewell party for Christopher Robin before he leaves for boarding school. 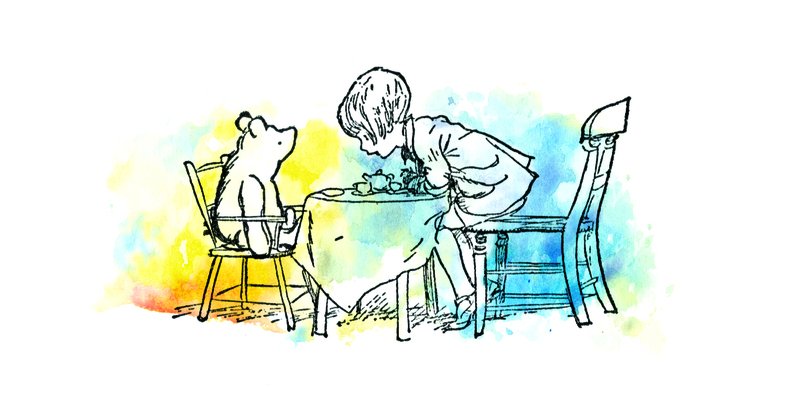 We created a simple invitation similar to the classic Pooh and Christopher Robin drawings by Ernest H. Shepard. We also created a pdf version that you can download with blank spaces to fill in your party’s information. Click here to get a free pdf Christopher Robin invitation. Since we don’t have a little wooden picnic table like in the movie, we created our own kid-friendly tea-table. 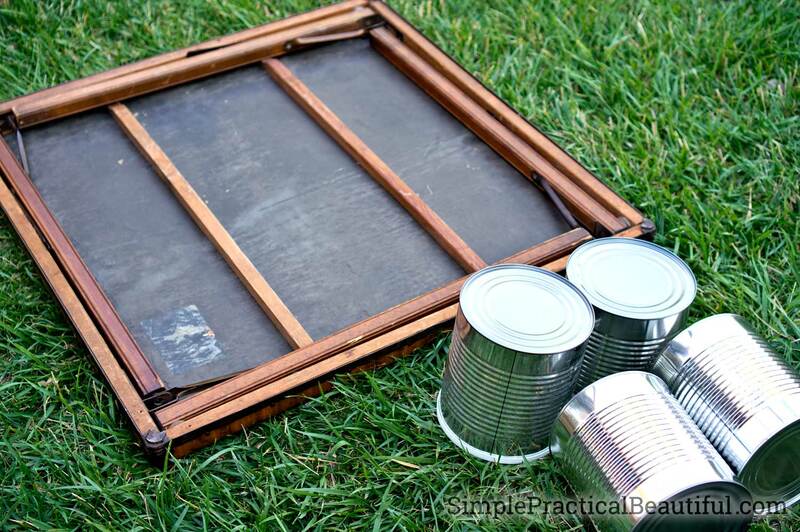 I used a card table with the legs still folded up and placed it on top of four #10 cans (coffee cans). This made the table the perfect height for a small child sitting on the grass. I set the table with white and neutral-color dishes and a white tablecloth. 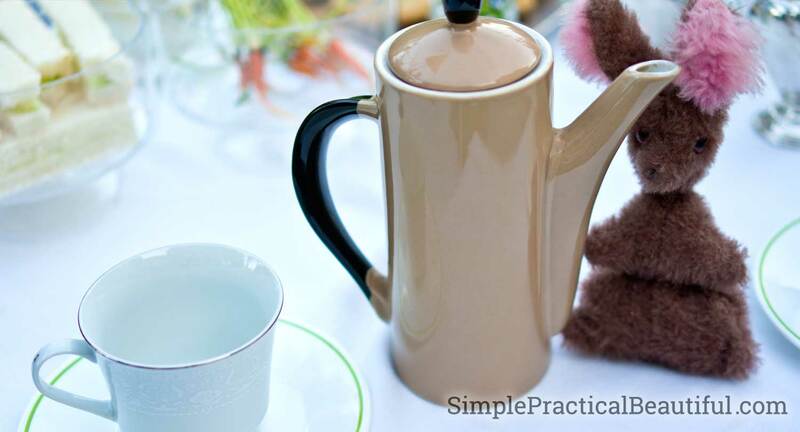 There are a lot of cute tea things, like this cream-colored tea pot, on Amazon. This tea party is a lot different from the pink and lacy tea parties my girls used to have when they were little. 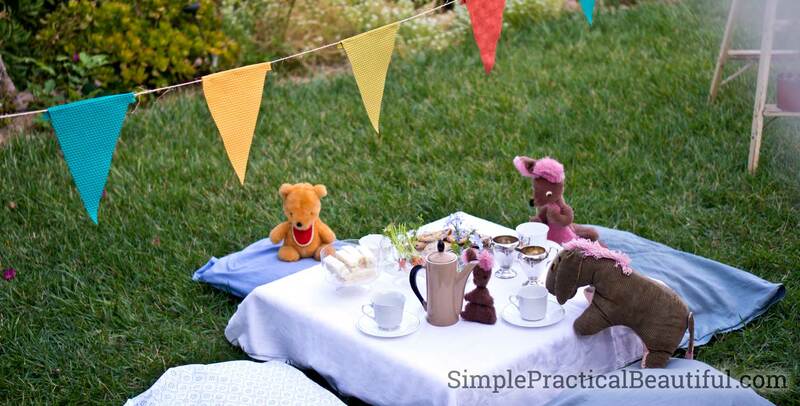 This tea party was for my son (who pretended he was Christopher Robin), so I tried to keep it more simple. 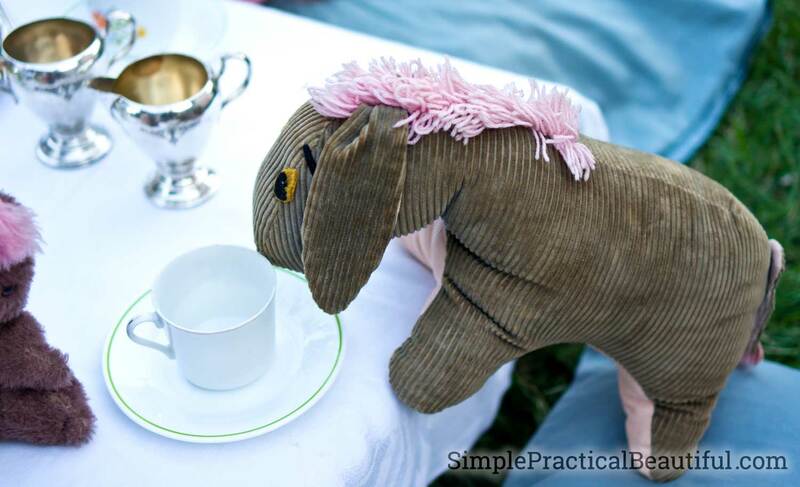 If you look closely, the tablecloth is worn and a little stained in areas, so it’s perfect for snack-time on the grass. Even the flowers in the centerpiece are less feminine, just like in the movie. And I pulled out my silver pieces that I shined up without using polish. 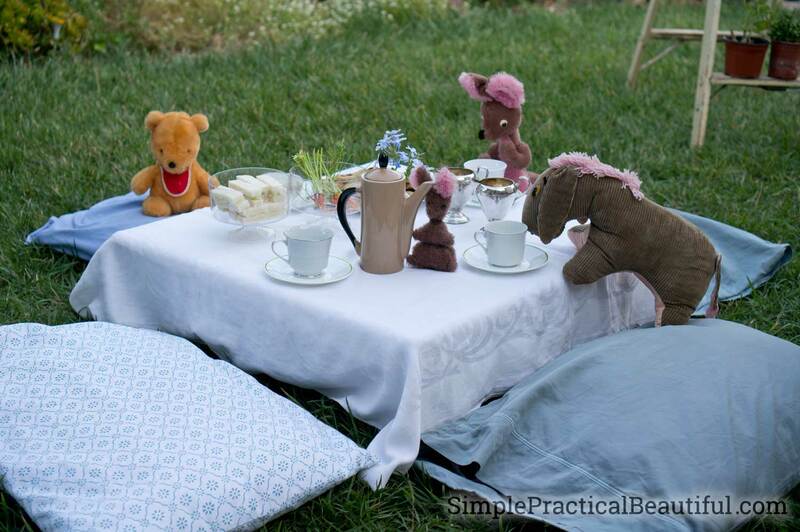 Instead of chairs, we could have had our guests and their stuffed animals sit on the grass. But we used pillows as seats to make it a little more cozy and comfortable. We hung a banner of flags above the table. If you want to be more true to the movie, write a message on the flags. 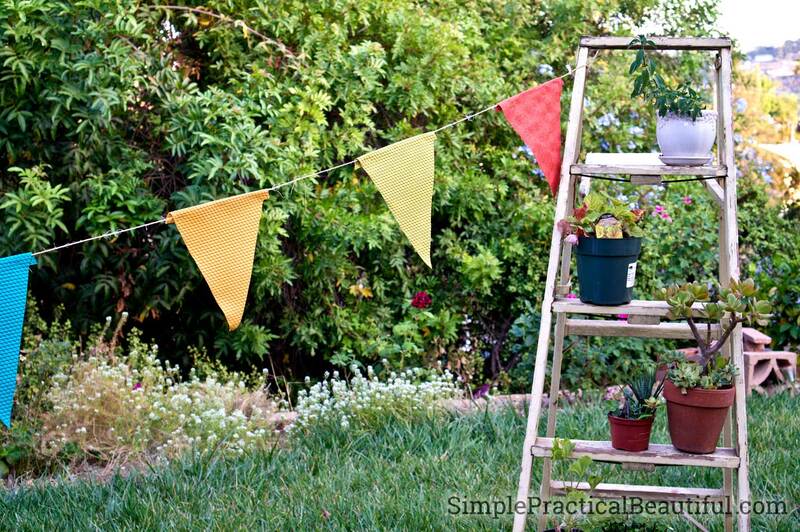 I tied on end of the banner to an old ladder, and put plants on the steps to deter anyone from climbing it. 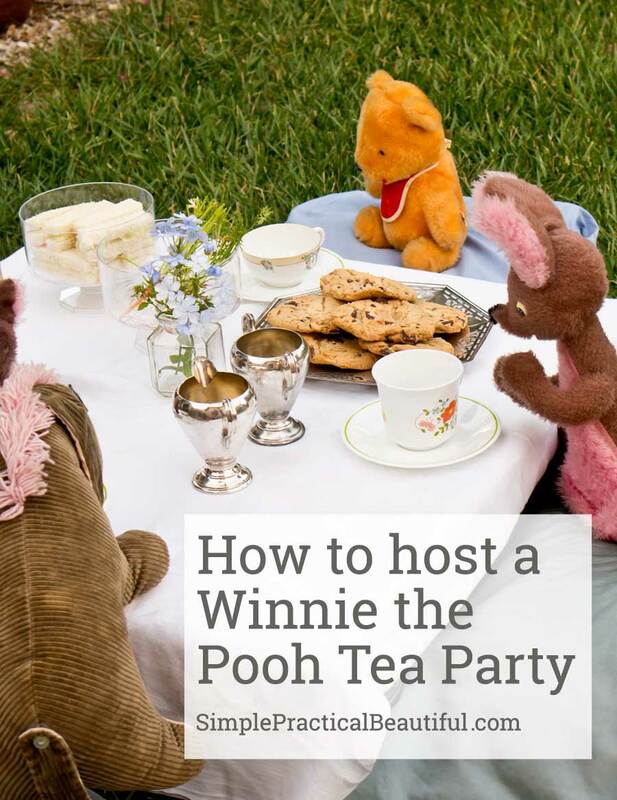 The tea party in the movie included marmalade sandwiches, cake, honey, and other sugary treats. 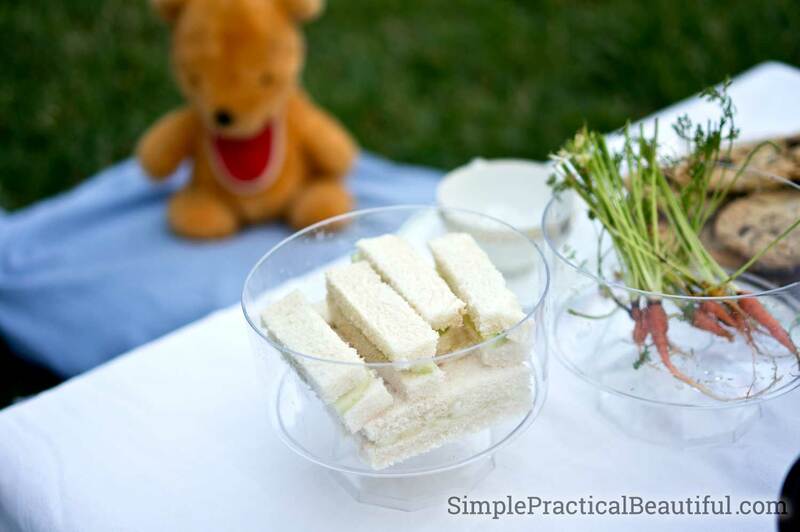 As a mom, I wanted the snacks to be a little more healthy, so we served cucumber sandwiches sliced into finger sandwiches. They are easy to make. Just cut off the crust, add the filling, and slice into four pieces. We also served cookies, and some carrots just for rabbit. We left some greens on the tops of the carrots just like the movie. Since they were baby carrots and fresh out of our garden, they were a big hit. I have to admit, I skimped on the tea and just served water. I didn’t want any tea-stained stuffed animals after the party. I guess I could have used apple juice in its place, but water was easier, and I didn’t mind when my pre-schooler poured his own. 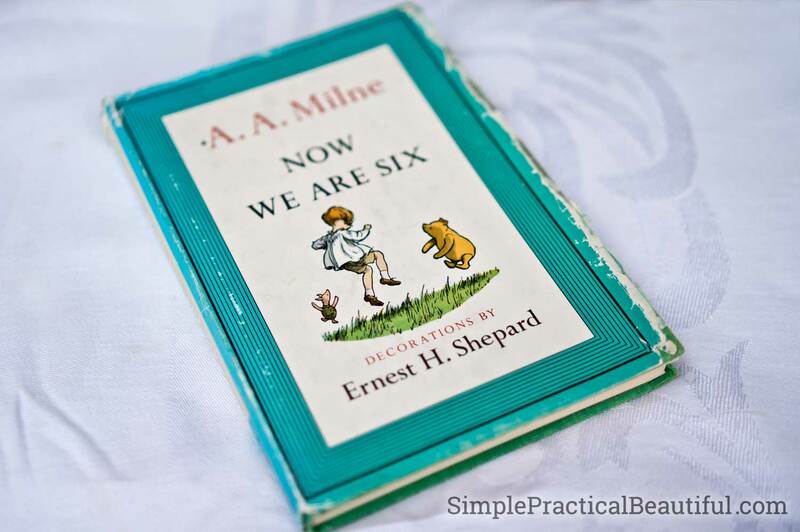 We also read a couple of poems out of my Winnie the Pooh book, titled Now We Are Six. You can tell by the wear that it is a well-loved book. Not all of our guests were from the Hundred Acre Woods. 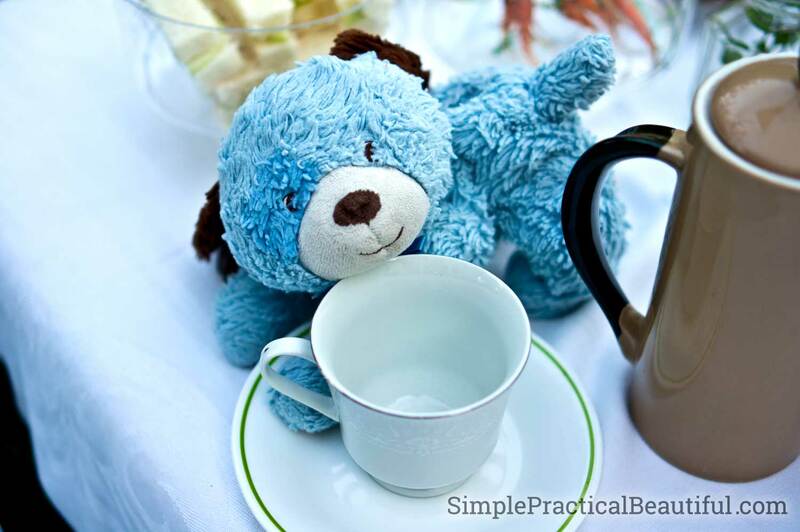 Any stuffed animal was welcome at our tea party. Everyone had a fun time, especially my 4-year-old son as he pretended to be Christopher Robin. But then, when you are young, anything is more fun with your favorite stuffed animals. There is a scene in the movie where Christopher Robin is following Pooh around his house and cleaning up the mess of honey Winnie the Pooh leaves in his wake. 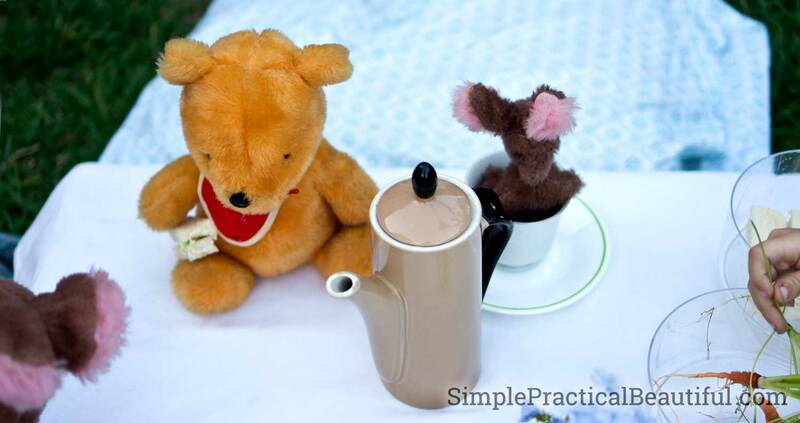 With that scene in mind, I decided not to serve honey at our Christopher Robin tea party. It would have been cute, and Amazon sells lots of beautiful honey pots, like this mini ceramic honey pot and dipper. But I just didn’t want to clean up the sticky mess.